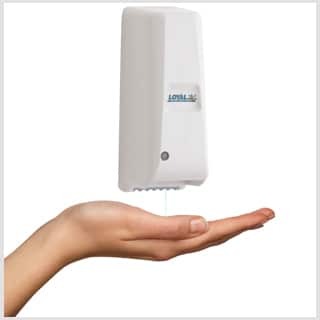 Our foaming hand sanitizer is a non-alcohol based formula that kills 99.99% of bacteria, moisturizes with Aloe Vera, and features a mild floral fragrance. Our hands-free dispensers come in either manual or automatic, providing better portion control and improved facility hygiene. Every dispenser comes with a lifetime guarantee so you will never need to pay for repairs. Choose black or white dispensers that either can be wall mounted or used with a free-standing unit. READY TO EXPERIENCE THE LOYAL DIFFERENCE? Let’s help your business reduce waste, cut costs, and improve facility hygiene.